Even though I’ve read some fantastic books over the last couple of weeks, I am beyond glad I started this Read-Along with all of these fantastic book bloggers! 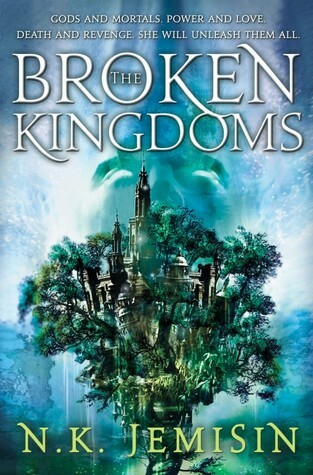 I’m coming a bit late to the party… all the way in Chapters 11 to 16, but I love this book (Broken Kingdoms), and all that comes along with it! It’s Week 3 of the Readalong already, but I’m definitely already obsessed with the book! The discussion questions were written by Violin in a Void (Lauren). Personally, I very much agreed with her decision. Despite the fact we all know as readers that Shiny is Itempas and really did do some terrible things to his siblings, Oree simply knows him as Shiny, her unspoken friend, first. From a moral perspective, I would have to agree that in a dangerous situation with an antagonist that seems to be a bit on the crazy side… it’s probably better to keep all of your eggs in one basket regardless of how you feel. If she had said something, I wouldn’t keep my eyes open for Shiny’s continuing health. I’m really glad she didn’t tell Dateh, and I shudder to think at the consequences otherwise. 2. Madding’s dead 😦 How do you feel about his death? What do you make of his last words to Oree? Gah. I was so sad and upset… It was horrific and although I’m sure it will have some role to play in the book later, it was still quite saddening. His last words were heartbreaking, but the real question for me was: Who is she a weapon to? I think Dateh’s interpretation of Itempan faith will hopefully snap Itempas out of it. He’s beginning to see something other than the day-to-day lives of humans, he’s seeing his faith do terrible things not only to his children, but to (probably) innocent humans as well. The whole idea of the godlings killing order does make sense, but it twists faith into something much darker and aimed with an intent to kill. So I do hope that this will help rehabilitate Itempas. Seeing what crazy power-hungry people will do in your name has to be a wake up call. I’d like to think Oree will survive the events of the novel, and honestly I don’t believe that demons should be wiped out. I know it is a law from the oldest times, but it comes back to the idea that a child is getting punished for its parent’s mistakes. That is not healthy for a growing society. Even though they are weapons, there are probably ways of hiding them, like a whole secret society under the radar thing. On the other hand, there’s a very strong chance Oree could die. Even though she has these powers, she is blind – which makes her not as able to defend herself. So although I’d like her to live, I have my doubts. I suppose in a way my feelings have changed about Itempas. In the first book of the trilogy, you meet him as this overpowering and arrogant god that has enslaved and killed other gods because they don’t fit into his definition of order. Not that it has changed that much. But in this book and after his feelings have been revealed – it changed the way I saw Itempas. Before and even during the book as Shiny, he seemed to be this infallible being. With this, he is brought down to earth and as a human, who among us can’t vouch for being too proud to stop their path, even though they knew deep down it was the wrong one? 6. There’s something odd about Hado. Shiny says to him, “You are not quite yourself […] Something of him lingers.” Oree notes that Hado’s shadow is darker than the non-magical things around him. Could he be more than just a spy, and if so, what? I find it particularly intriguing that we’ve never had an image or Hado described to us. Of course since the book is told through Oree’s perspective, we don’t have lots of ideas of what people look like, but it’s interesting nonetheless. My first though was that it was Nahadoth, but then I thought – it couldn’t possibly be him?! Right? I’m still convinced it isn’t Nahadoth, but there must be some connection. For me, the mentioning of the darker shadow is a killer idea that it is something connected with Nahadoth and Shiny’s past. 2. I think Oree is a weapon not only to Dateh but to anyone who would use her blood against the gods. And the problem is that some gods only see her as being a weapon. 3. I think it’s important that Itempas sees his children killed in his name. At this point I don’t think he cares much about humans. 5. Totally agree about Itempas acting like an overly proud human who just can’t admit he was wrong. Eeps I’m just so glad I found you guys before you were too far in! 4. 😀 yes indeed she does! Is it weird that I feel bad for Itempas, even after all that he’s done? And I can understand why he’s being punished, and see that it’s necessary, but he’s just so pitiful that I can’t help but feel sorry for him. Not at all! I feel that way a bit too I think. It’s not so much I don’t despise him for his past actions but yeah – he acts so pitiful that’s it’s frustrating. Meh. It’s frustrating. I just wish he could have something to make him happy. Good question – Oree as a weapon: to be used by who against who? I can see that going a few different ways. I like that we get to know Itempas as a person(?) in this book. His arrogance is shooting not only himself in the foot, but all his family, and potentially humanity as well. Also, you mention that Oree gets to know him simply as Shiny at first. It is only later that she gets his history revealed to her. And I have to say that this is so for most of us humans and our interactions with others. People come into our lives and many times we only learn of their past later and perhaps we wouldn’t have liked a person if we had met them as a teen, or a drug addict, or a radical political group volunteer, or a vegan, etc. Oree is taking Itempas as she found him, as Shiny, and running with that. Sometimes, that is the best we can do. Acknowledge the past misdeeds of friends and still keep them as friends. I like that too 🙂 I can’t wait to find out more!